Allahuakbar. Allah is Great. I am awakened by the recitation of these words on Sunday morning. Reza’s dad* is performing his Fajr prayer in the second living room next to where I sleep. I want to get up but I wait until he finishes his prayer. I saw him bringing his stone and a small carpet mat (sajadah). He uses the stone when he prostrates. Instead of placing his forehead on the sajadah, he places his forehead on that small stone. I have seen these stones before when I was in transit at Sharjah International Airport. I think it was the first time for me to see anyone praying with a stone. Like many other Iranians, Reza and his family are Shia, the other denomination of Islam that we know little about. The use of stone during prayers is one of many indications that a person is a Shia. Over breakfast, Reza’s dad asks me, “Sunni?” Yes, I am. He smiles and then he motions his hands and put them on his chest. I nod, confirming that I put my both hands on my chest when I do the stand-up portion of my prayer. The Shia pray with different hand postures, i.e. with the hands to their sides, just like the followers of Sunni’s Maliki school. 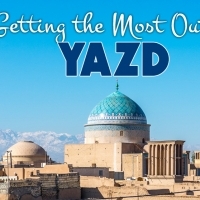 All those differences do not really bother me, so we move on to talk about something else while enjoying my first Iranian breakfast with three different slices of bread, two different jams, and an Iranian feta-like cheese. It is delicious. My favourite is definitely the cherry jam. I follow how Reza and his family eat the bread. Instead of taking a big chunk of bread, I take a small piece of Lebanese-like bread — the size is enough to be stuffed in my mouth, put a little bit of feta cheese and cherry jam, and eat it like Iranians do. An hour has passed and the clock is ticking. It is 8 AM now. 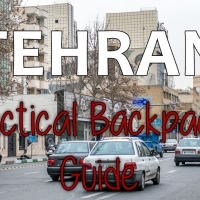 Today will be the first day that I will see and explore Tehran. 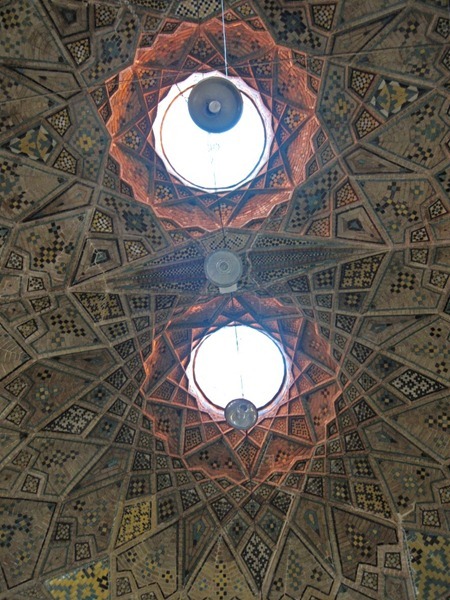 It will also be my last day in Tehran, as I will be taking a night train to Esfahan. I really need to get moving. Before leaving, I ask Reza for direction and tips on where to go. I realise how unprepared I am. I have no concrete plans, nor do I have any ideas what I should see in Tehran. 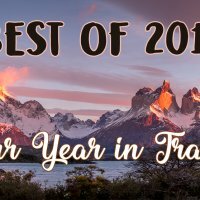 I could not bother to read travel books or blogs. I just want to surprise myself with Iran, so this is how I do it. Once I write all his recommendation on my notes, I pack my stuff, leave my heavy backpack in his house, and wishes khoda hafez to the parents. That is a new Persian phrase that I learn. 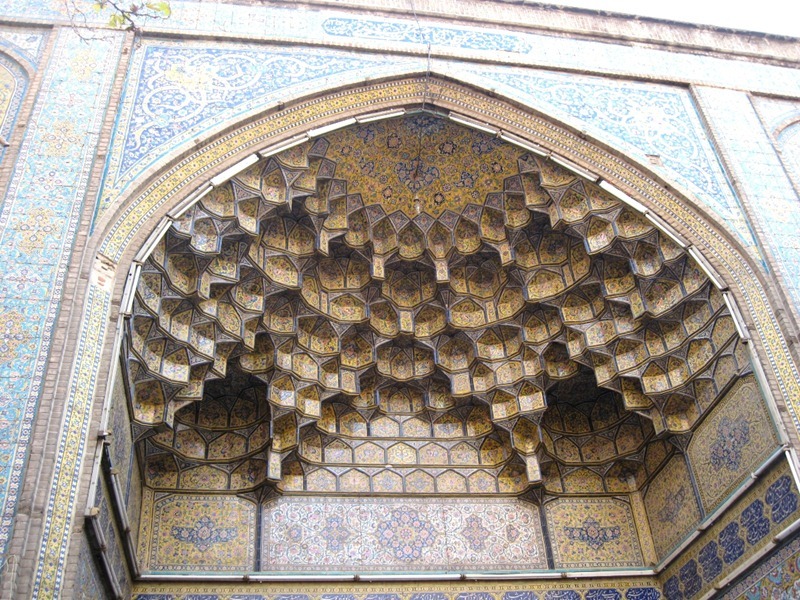 It means “May God protects you”, which is a common parting phrase in Iran. I love saying that phrase. It’s easy to remember too! I am on my own now, heading to the centre of Tehran to meet my Malaysian travel mates, Ikmal and Nabilah. We are going to meet at 9 AM at one of the metro stations, Mellat. Before I can go there though, I need to take a bus to Meydan-e Azadi (Azadi Square) station. 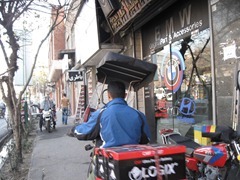 Reza’s house is only a few minutes walk from the bus station, which is very convenient. 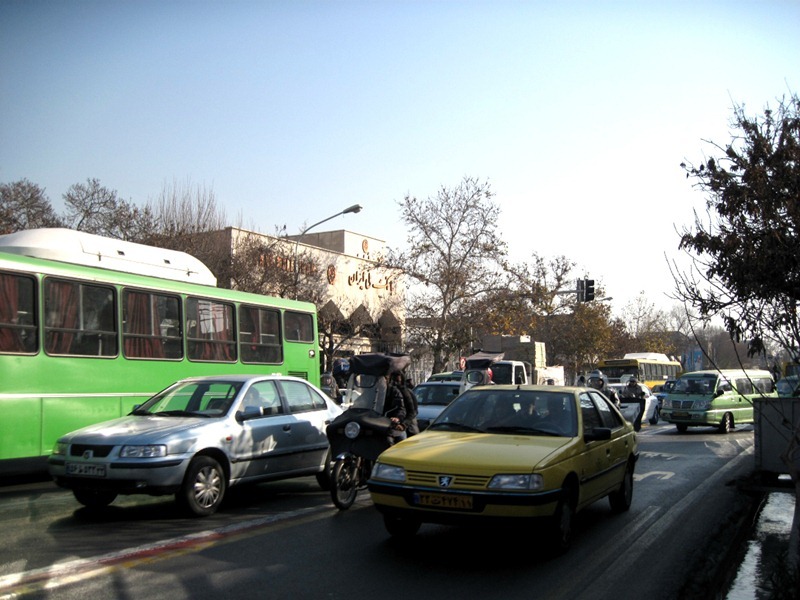 Just like Jakarta, it turns out that Tehran has its own bus rapid transit system. The station is clean and the buses look new. I confidently hop on the back of the bus as soon as it arrives and all eyes are suddenly on me. I am stunned and embarrassed before I realise that I’M AT THE MEN’S SECTION. How can that happen?! I remember I saw some buses with the men’s section in the front. Yes, I definitely saw it. Why is this bus different?? Ah, nevermind. It is too late. I can not be bothered to get out of the bus and go to the front section. I say to myself, Amalia… just act stupid and take the seat like nothing happens. 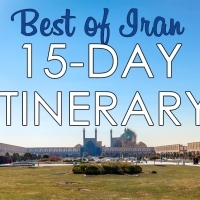 They know you are a tourist and not Iranian, so they will forgive you this time. That’s exactly what I end up doing :). It works like a charm. Isn’t it good to be a tourist, sometimes? 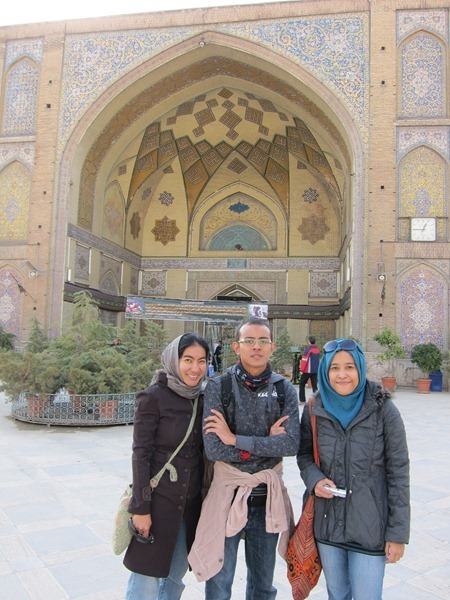 After a long journey to the centre of Tehran, I finally meet Ikmal, who will be travelling with me for the next 4 weeks and Nabilah, who will be with us up until Egypt. It feels so good to have travel buddies, especially in this strange country that I know little of. It feels awkward to be stared at all the time when you are alone. So I am very glad that Ikmal and Nabilah are with me now. Anyway, our first stop is the Grand Bazaar, as recommended by my host Reza. We will be meeting with another CouchSurfer, Saeede, whom I contacted to show us Tehran around. We are going to meet her at the Bazaar at 11 AM. 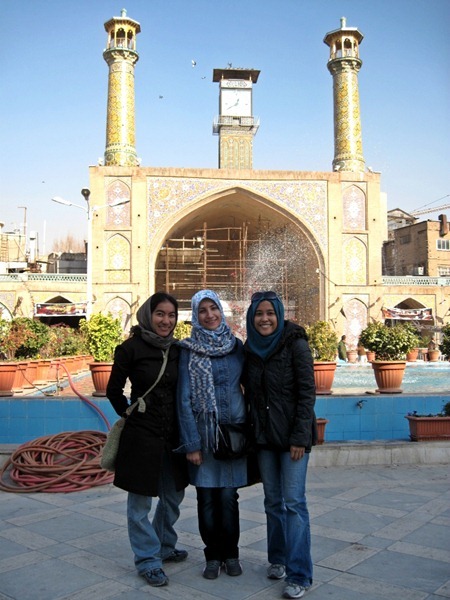 Since we have a very limited time in Tehran, having a local to explore the city with us is usually advantageous. They know where to go and where the locals hangout. They are aware of any scams (if exist) and tourist traps, so we will never be fallen into them. They can tell us about their culture or any information that cannot be found in Lonely Planet. 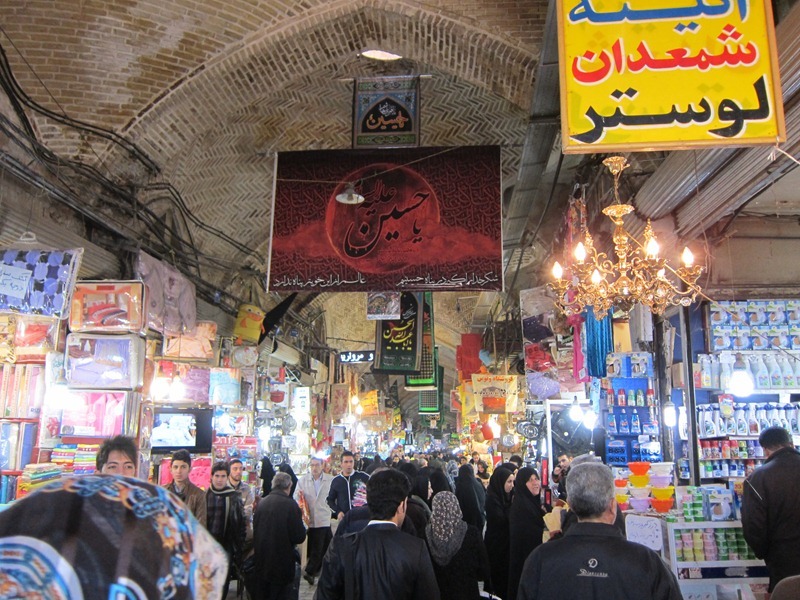 The Grand Bazaar, including the area surrounding it, is super crowded with people. 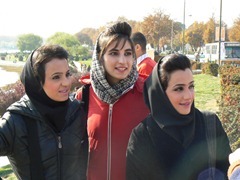 It is almost impossible to spot Saeede, because all Iranian women look the same to me. As I have contacted far too many CouchSurfers, I am not able to remember how exactly she looks like. 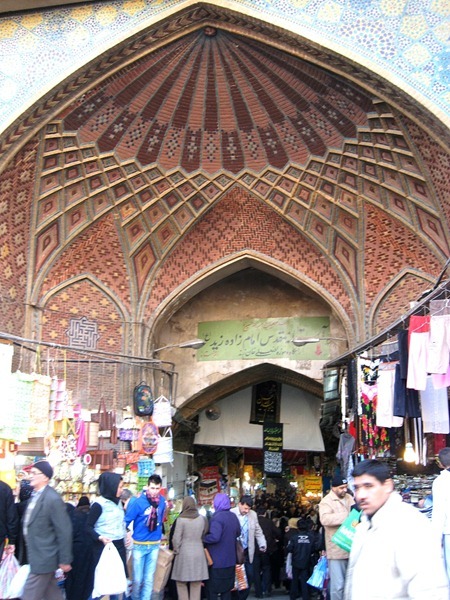 But finally, after making several calls, we manage to bump into each other at the main gate of the Bazaar. First impression? She has pretty eyes and seems very friendly! Saeede is a Law student who has just graduated and is currently doing volunteer for refugee kids from Afghanistan and neighbouring countries. I contacted her due to her vast knowledge of Iranian history and culture, according to one of her references. After all the introduction session and bla bla bla, we enter the Bazaar, going from one corridor to another, from one shop to another, to find a long coat/manteau for Nabilah. In addition to headscarves, all women in Iran are required to wear loose-fitting clothes that cover down to mid thigh area. The rule applies to foreigners as well. Nabilah, who was not aware and not prepared about the Iranian dress code, has to buy one manteau for herself. While Nabilah and Saeede are busy shopping, Ikmal and I are busy with people watching. I notice that most Iranian women do wear a long coat, usually up to their knees. Some wear chador, a black cloak that is similar to what is worn by the Arabs, albeit more loose and complicated. For the headscarves, there are a lot of variations. For those wearing chador, their headscarves are proper and tight. They place the chador on top of the head too. The majority of Iranian women wear their headscarves loose, sometimes it looks like the headscarf is about to drop completely (I have no idea how the headscarf keeps intact!). The front part of the hair is shown. It is probably a trend or something, but some women have their hair on the top of the head raised soooo high, which I feel a bit too much. Some Iranians, including Saeede and I, would wear a scarf like many other Muslim women in other countries do. 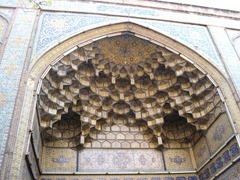 Saeede explains that it is very common in Iran to distinguish a person’s faith according to how she wears her headscarf. Women who wear the chador and/or a proper headscarf, for example, is widely known to be very religious, strict, close-minded, and a true supporter of the Islamic Republic (government). Those who wear a headscarf with their hair shown, however, are associated with anti-government and non-religious. Such distinction is absurd if you think about it, but the more you mingle with Iranians, the more you agree to distinguish people based on the cover. Saeede, interestingly, does not agree with such stereotype. She wears a proper headscarf, prays five times a day, and considers herself a devout & moderate Muslim, but she is open-minded and she tends to oppose to most actions done by her governments. She tells me that it was only recently that she decided to wear a proper headscarf. Some friends and people around her questioned her decision and discouraged her from donning a headscarf. This is such a different mentality compares to Indonesia, for example, where many people would encourage and support you 100% when you decide to cover up. It seems that being a “little devout” in Iran is not something that is perceived as a good thing by the majority of Iranians. Once Nabilah finds the manteau that she likes, we decide to go to pray in a mosque located in the bazaar area. Saeede and I go to the ablution area to perform wudu before our prayer. As I reach the end of my wudu, I realise that the sink is too high and I am not able to wash my feet on it. I ask Saeede how I should wash my feet and she tells me that Shia’s do not wash the feet like Sunnis do. They only need to wipe the top of their right foot and that’s about it. For me, I need running water to wash my entire feet and the only way I can do that is to go to a toilet. This is yet another interesting difference between Shia and Sunni that I come to find within 24 hours in Tehran. After performing wudu, we go to the women prayer area. The congregation prayer has started a long time ago and almost completed. I can see many stones placed nearby the door and it seems that I would be the only one praying without the stone. As soon as I finish my prayer, I can feel that the whole room is looking at me, either because I am a foreigner or because I pray without the stone. Whatever that is, I response with a smile coz I know my smile is quite powerful. LOL. 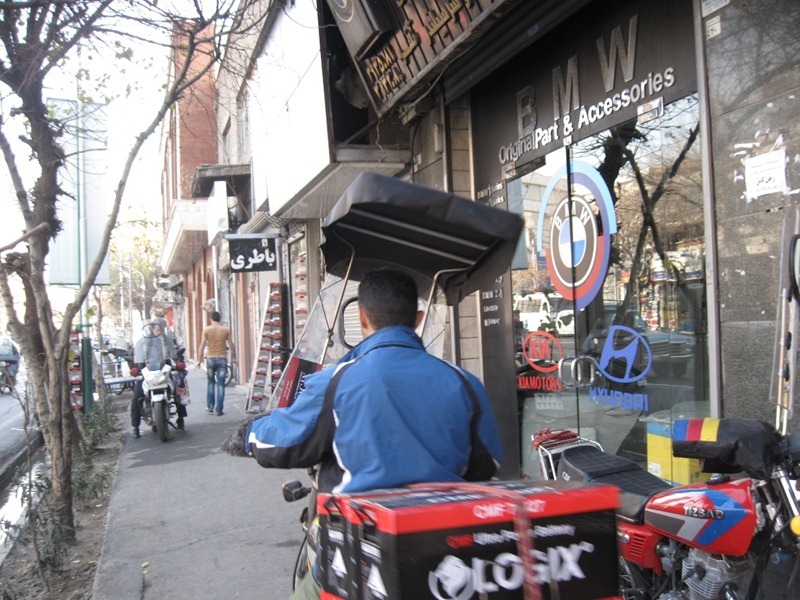 All of us are quite hungry now and it seems like a good time to have a real Iranian lunch. Once thing not to be missed before going for lunch is to take pictures in front of the mosque!